Just recently Nintendo of America revealed the eight qualifiers for the Nintendo World Championships final event, taking place in LA on 14th June. These hardy souls made their way to qualifying events and set impressive scores in the Championship Mode of Ultimate NES Remix to secure their spot. With travel and accommodation paid, and the opportunity to compete in front of a live audience and thousands of spectators around the world, we're sure the finalists were thrilled when their places were confirmed. We've now been sent a video that shows that very moment, as Christopher B is out shopping when he receives the call. Though he keeps his composure and impeccable politeness, it's clear that it's an emotional moment for the gamer. With thanks to Eric for sharing the video. The epitome of 'holding it together' - What a pro! The smile of a manchild, hardly anything more precious than that. A representative from Ohio! I know who I'm going for! 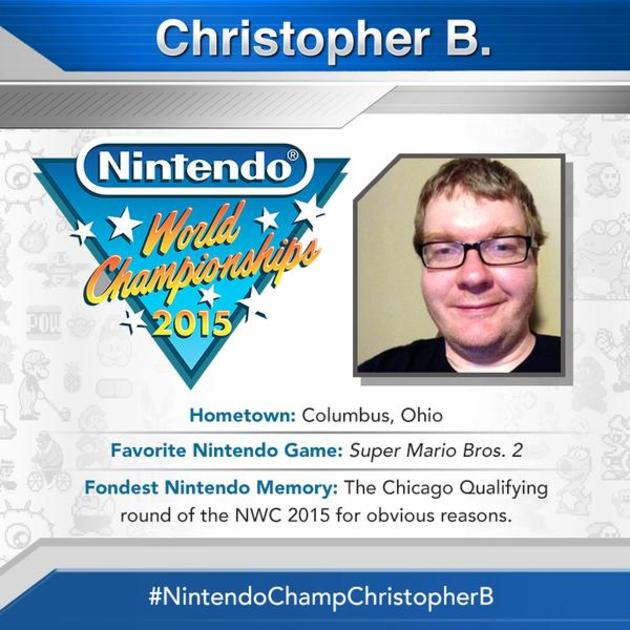 We're going to have the Nintendo World Champs, College Football Champs, and NBA Champs! I hope he has a great time! The pressure to do well would be too much for me to handle. He's far more composed than I would have been! Good luck to him. lame. i was expecting him to smash the whole super market and totally going nuts. @6ch6ris6 LOl. your comment made me spill water a bit. hahaha. good image. If you're a gamer and don't smile at this then you're dead inside. I couldn't help but to smile for him. If it have that effect on someone who is watching a video, I can only imagine how he and the rest of finalists feel. he looks so happy, like, geniunly happy, good for him. What, no fist pump??? Love the supportive reaction of his significant other, though. I love that his favourite Nintendo game is Super Mario Bros. 2! Not my favourite but it sure has some interesting elements. You just know that this guy is a long time gamer. Good luck to you Chris!! Fantastic video thanks for sharing, delighted for him!